While it is a tough pill to swallow, it is time for the Calgary Flames to admit their 2015-16 season is a lost cause and start putting the pieces in place for a busy offseason. The first order of business for GM Brad Treliving and President Brian Burke is to start testing the trade waters to see if it is possible to move some of the players who will not be a part of the 2016-17 squad. 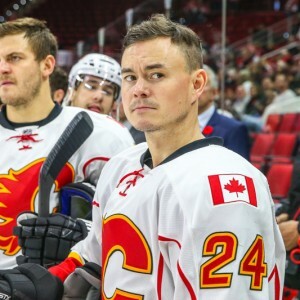 Jiri Hudler, David Jones, Kris Russell, Jonas Hiller and Kari Ramo are all unrestricted free agents at season’s end and might be able to fetch a decent return. Come February 29 Jiri Hudler will no longer be a Calgary Flame. The 31-year-old centre, who has limped through a disappointing campaign with Calgary, will definitely see some interest in the trade market. At 5”10, 186-pounds Hudler isn’t the biggest centreman available, but his terrific offensive instincts, creativity and quick accurate wrist shot make him excellent addition for any contender. Anaheim and Nashville are two of the more likely destinations for a player like Hudler. They have cap space, will both be looking to add some depth, and would be able to swallow the remaining money left on Hudler’s $4 million contract. Look for the Flames to use Hudler’s 31-goal 2014-15 campaign as ammo in an attempt to fetch a third or fourth round draft pick. The biggest trade chip the Calgary Flames have could be defenceman Kris Russell. The 5’10”, 170-pound Alberta native has solid speed, is a tremendous shot-blocker and could slot well into the second power play unit of a contending team. The puck-moving defenceman, who was acquired in a 2013 trade with St. Louis, will become an unrestricted free agent at season’s end. While Treliving might not want to get rid of the 28-year-old defenseman he has backed himself into a corner with several other large contracts on the back end. Calgary has $29.8 million committed to six defencemen for next season – Dougie Hamilton, Dennis Wideman, T.J. Brodie, Mark Giordano, Ladislav Smid and Deryk Engelland – and might not have the money to retain Russell. Flames fans might be hesitant to see the team part with Russell, but he is the most attractive piece of trade bait the Flames have and they need to part with a defenceman. Wideman has one-year at $6 million left on his deal, Smid has one-year and $4 million remaining and Engelland has one-year at $2.275 million. Considering how many teams are tight to the salary cap, any contract becomes tough to trade. Most of Calgary’s defenceman would be difficult to move in today’s market. Along with Jiri Hudler, forward David Jones probably won’t be playing in Calgary next season. It is not that the Flames don’t want him. They can’t afford him. The main goal for Treliving this offseason is going to be trying to sign contract extensions with young superstars Johnny Gaudreau and Sean Monahan, as both are restricted free agents as of July 1. This could prove to be challenging for Flames management as Calgary has $49.775 million committed to eight forwards, six defencemen and no goaltenders for 2016-17. Providing the cap increases $3 million to $74.4 million, Treliving will have $24.6 million to sign Gaudreau, Monahan, four other forwards, two goaltenders, and two more defencemen. 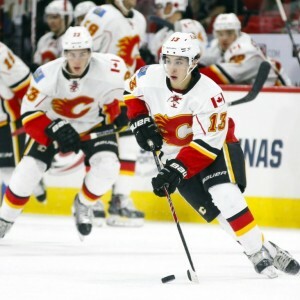 If Gaudreau and Monahan both chose to ink long-term contracts the Flames are looking at a couple of four to six-year deals worth an average annual salary of at least $6 million. As it stands Calgary’s highest paid forward is Michael Frolik at $5 million, which gives both Gaudreau and Monahan the ability to ask for upwards of $6 million. Look for Hudler, Jones and possible Russell to be shipped out-of-town for draft picks, no matter how low they are, so Calgary can ensure they can retain both Monahan and Gaudreau and have wiggle room to fill out the rest of their roster.